Home / 2018 / July / 24 / Who wants an awesome cheap razor? Who wants an awesome cheap razor? I hate shaving almost as much as I hate washing my brushes. It’s just so time-consuming, and because I’m a huge klutz and my legs are usually covered in bruises and/or scrapes, it’s occasionally also painful. But I don’t like walking around with hairy man legs, so it’s something I suffer through. I’ve been using a razor from Billie, and while I love it, I’m getting to the point where I don’t really want to deal with subscription services. Maybe someday when I get my life together and can remember the billing dates for them, but today is not that day. I’ve also ended up with a surplus of blades that I’ve paid for that may very well get lost in my upcoming move. I’ve changed my delivery frequency so this hopefully doesn’t happen again, but sometimes I’d like to be able to order blades when I actually need them. I was thinking about this while scrolling through Facebook, and as if Zuckerburg could read my mind, I saw an ad for a company called Dorco. Never heard of it, but I checked it out and saw 6 blade razors for $6.50. Yes, even fancy lady razors. I thought it was worth investigating. 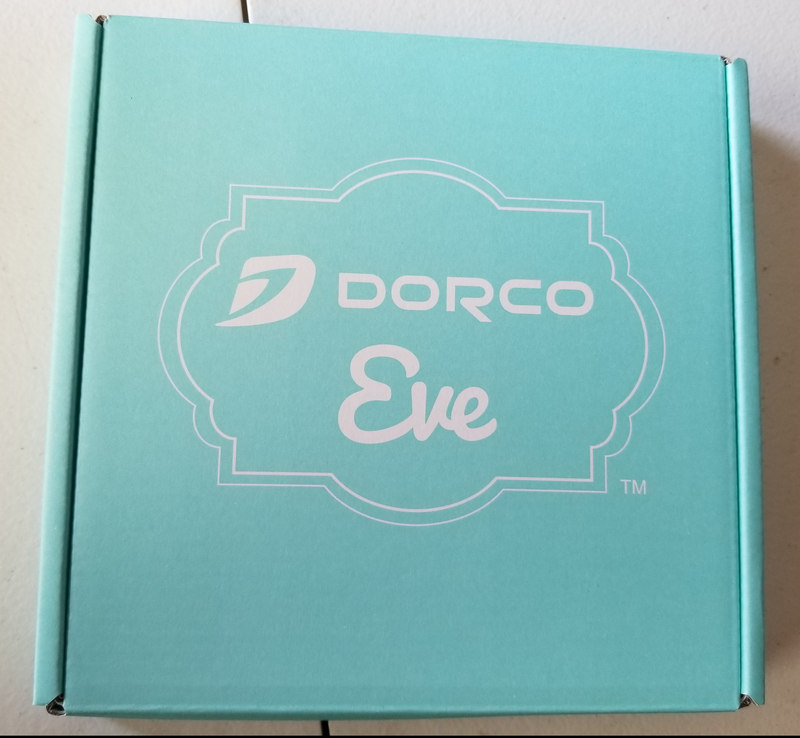 I purchased the Eve razor. For $6.50 I received the handle and two blades, and they came in this super fancy box. 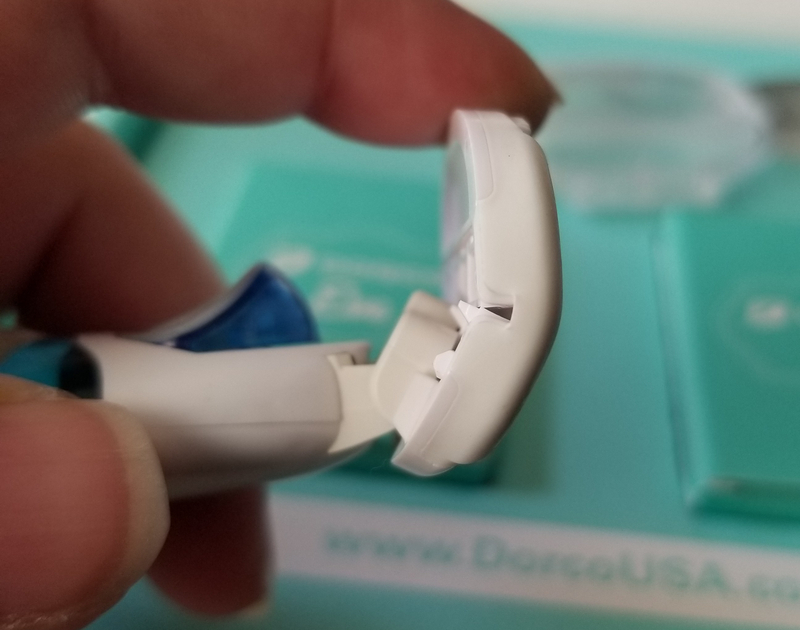 The blades are kind of strange; there are three blades separated by a… hinge? 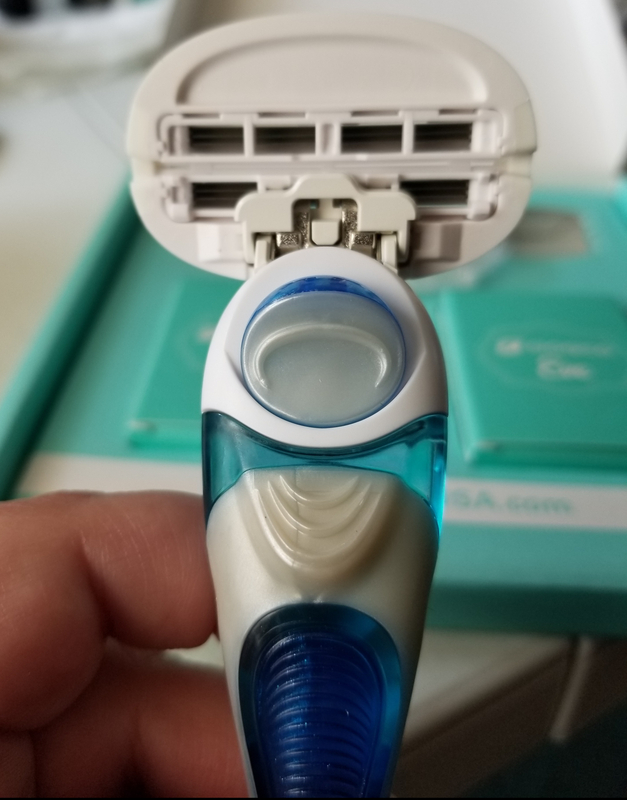 They call it a “multi-flex pivoting head”, which sounds like a bunch of marketing jargon for “weird but also cool flexi thingy that makes me less likely to cut myself”. There’s also a nice moisturizing strip and some plastic ridges that are supposed to make the hair stand up for a closer shave. The handle feels like it’s good quality. It’s not heavy but isn’t so light that it feels cheap. There are some nice rubbery bits and divet things for my fingers so it feels nice to hold. 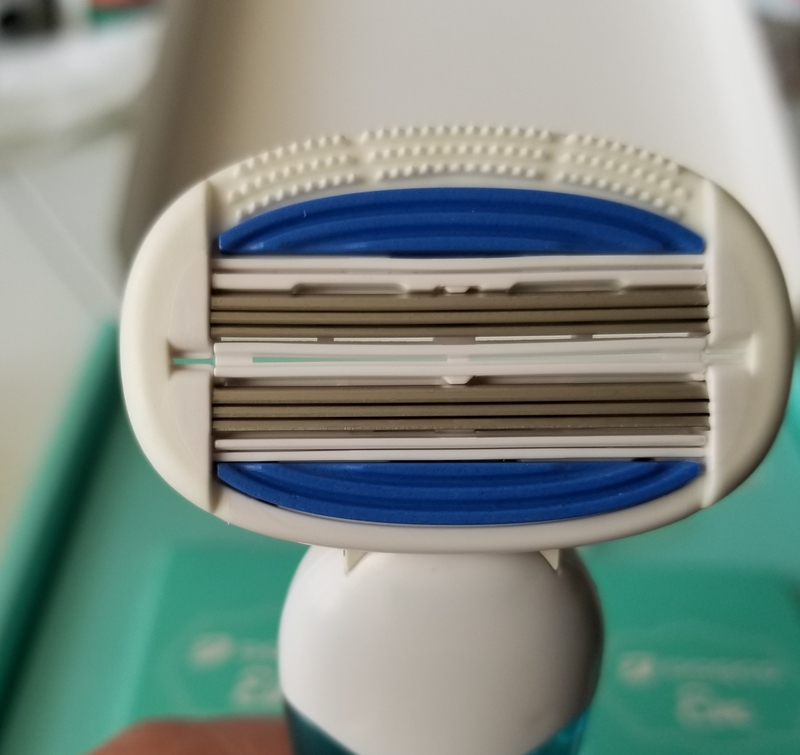 One of the best parts about this razor is that it’s compatible with almost all of Dorco’s blades, so I don’t necessarily have to get these again if I don’t like them. 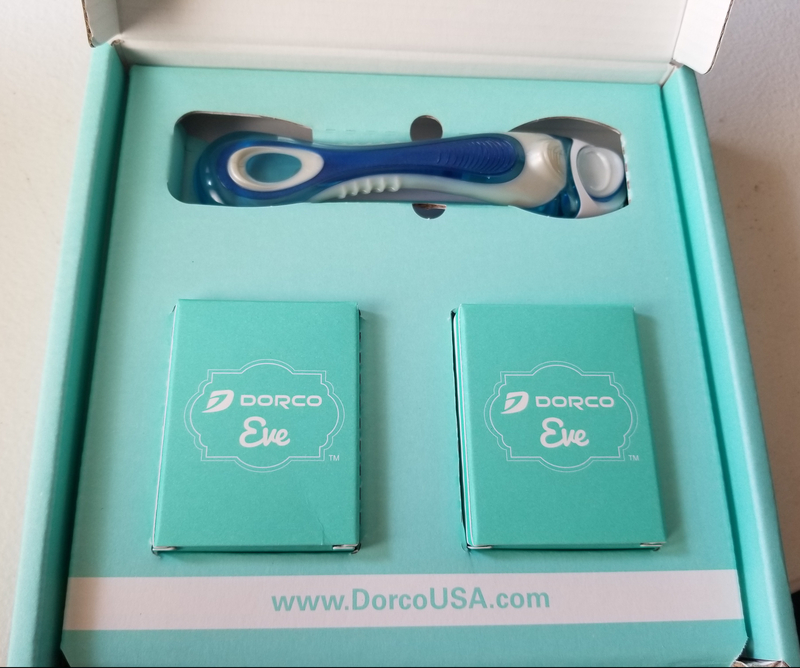 A pack of four eplacement blades is between $6 and $10, depending on the type I choose, and I don’t have to sign up for any kind of subscription. I buy them when I need them. I’ve only used this razor once, but so far so good. Razor burn was at a minimum and it took a couple days for me to start feeling stubble. My skin didn’t look dry or feel scaly after shaving, which is excellent since I almost never remember to put on lotion. I won’t be shaving again for a while since there was a slight mishap with a sidewalk while Sarah was here (yeah, I totally bit it. I was sober), but I’m fairly confident I’ll continue to enjoy this razor. I probably need a razor subscription service if only so it forces me to swap out my blades more often – I use my razors way past their expiration date…partially because I’m lazy, partially because I’m cheap and partially because I’ve got too much stuff on my to do list so swapping out razors almost never registers. On another note, I have historically been bad about putting lotion on regularly for two main reasons: (1) it’s time consuming; and, (2) it’s messy. What’s saved my skin this summer is an in-shower body lotion that I slather all over after I wash my body. It soaks, and gets locked, into your pores that are wide open from the heat – and you rinse off any excess. It literally takes me about a minute and a half to put lotion ALL OVER and I feel its effect all day. If you haven’t tried it, I strongly suggest it! I’m a little embarrassed to admit this, but I have an in-shower moisturizer in my closet that I completely forgot about until I read your comment. It’s been there for a year. I guess it’s time to pull it out. Let me know what your verdict is – I LOVE it!! I’m waiting on a 6 blader to try out myself. It’s from a company called Bromley. 6 blades seems excessive, and now that I’ve saw yours and how that actually looks in practice…. that’s a lot of blades lol! 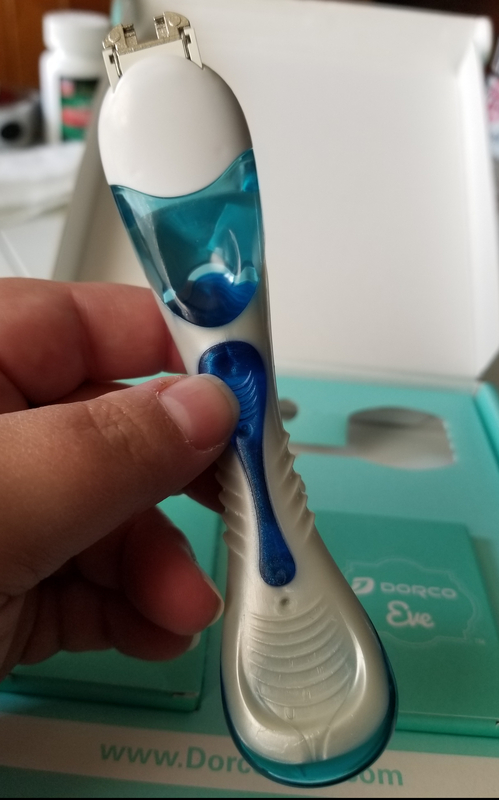 It is a lot… I think most of the other razors I’ve used were five, but this one makes my skin soooooo smooth. I’m a hairy Sicilian so I appreciate that.